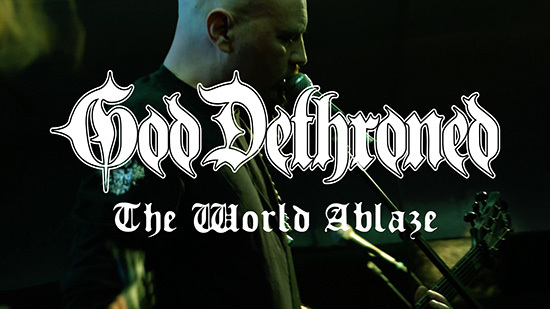 GOD DETHRONED releases new single and video for title track ‘The World Ablaze’! ‘The World Ablaze’ out May, 5th! On May 5th Dutch Death Metallers GOD DETHRONED will release their new album ‘The World Ablaze‘ worldwide via Metal Blade Records! Surf now over to youtube.com where you can check out a video for the brand new 2nd single and title track ‘The World Ablaze’! Click metalblade.com/goddethroned to check out the first single ‘On The Wrong Side Of The Wire’ as a videoclip! Make sure to have a look at the pre-order section, you can purchase ‘The World Ablaze‘ either as a CD/DVD Digi package, as a regular jewelcase-CD or on vinyl. There’s also shirt bundles available. The bonus-DVD features full GOD DETHRONED live shows from Graspop 2016 and Rock Hard festival 2015! GOD DETHRONED will play two German release shows on the weekend of release and one Belgium and two Dutch ones the following weekend. Please spread the word!